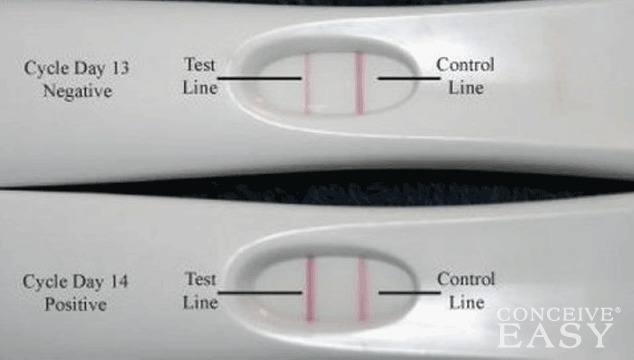 When you are getting ready for IUI, you will need to take an ovulation predictor kit test every single day. These test kits are available over the counter at many drug stores, and they are inexpensive, so they are easy to obtain. The preferred way to test is once in the morning and once in the evening, but sometimes, your doctor will tell you to only test once during the middle of the day. The LH surge can come and go very quickly, so testing often is usually preferred. When your LH surge occurs, the Ovulation Predictor Kit will show a color that indicates that the surge has occurred, and then you will know that ovulation is getting ready to happen. Depending on your doctor, you will get different directions on what to do when you get a positive OPK test. Some doctors will prefer to do the IUI the same day, and some will prefer to do the IUI the day after the surge. Some doctors tell their patients that if they get a positive OPK in the morning or at noon, then they will do the IUI procedure the same day, but if they get the positive result in the evening, you will have to wait and do the IUI procedure the following day. Still other doctors have different procedures and protocols for their clinic’s IUI procedures. Ask your doctor so you know exactly what is going to happen after you get that positive OPK result. After you go into the clinic for your IUI procedure, the concentrated sperm will be carefully and painlessly inserted into the uterus via a catheter. Since only the “best” sperm are used for IUI, it usually has a pretty good success rate. IUI is a relatively simple procedure, and doesn’t require anesthesia or any other drugs. It’s also fairly cheap when compared to other fertility treatments. If you haven’t given IUI a thought before, you should think about it if you are struggling with infertility. It is a great option for many couples, and it might be a great option for you as well.